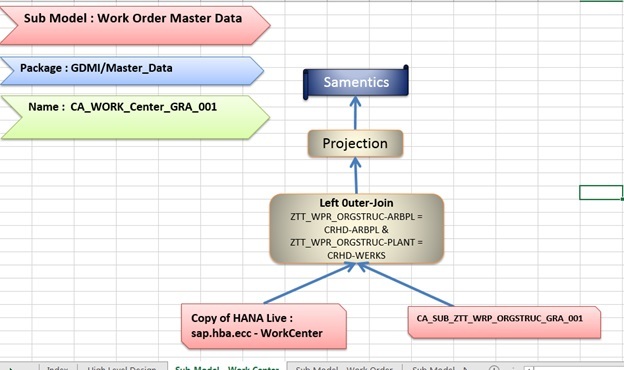 While designing the information views in HANA person wise the design pattern and implementing approaches changes. 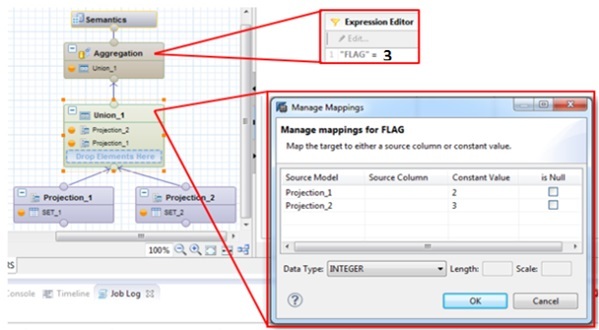 In this blog I am going to discuss about the better approaches which of design and implementation pattern of HANA information view. We can reduce the data volume but subset the data by joining with the larger table which can cause a time out error if we join directly with the no of node in the main view. In this approach we will avoid single data source (or node) feeding multiple nodes in calculation view. 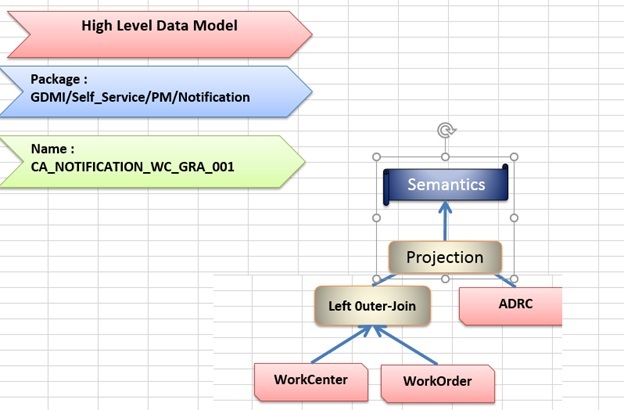 We created a sub model WorkCentre and squeeze the data inside the sub model and then Merge in the main model. Union is much faster than join. So if possible as per the requirement scenario where need to use join, instead of join we will use UNION. UNION will be used as inner, left outer, right outer, inner and full join. Please find the below example how we can use it. 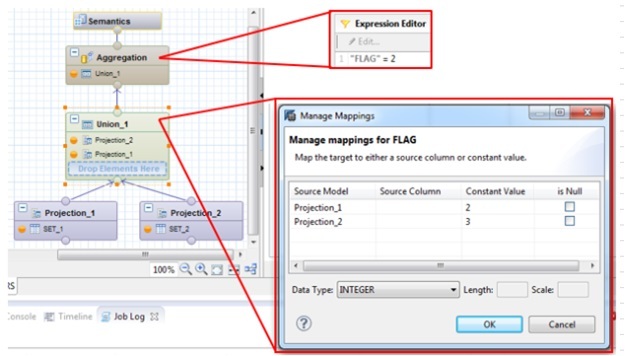 Create a calculation view using UNION of two projection node instead of join and create constant flag 1=2 and flag 2=3 on each node (Projecttion_1 and Projecttion_2 respectively). Merge them into third constant FLAG in the UNION. When the table size is large and that to consume from a projection node of a calculation view, need to use aggregation node (to aggregate the duplicate row in the transactional table) on top of the consumable projection node. In the way the row number will be reduced and the subset size will be less before joining to the main information view. While design always prefer Graphical view instead of SQL script view. 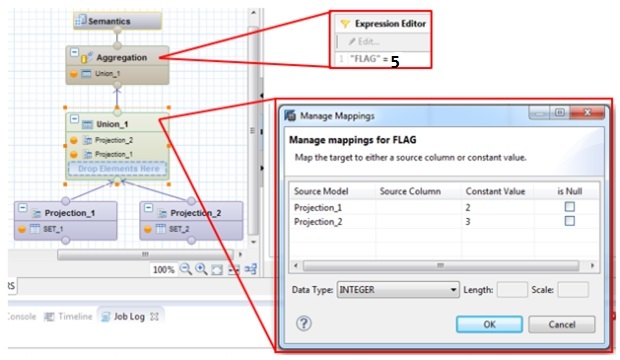 In Graphical view HANA provide the facility to optimize the query in the execution plan automatically. HANA itself maintain that. We do not need to take care of the optimization. But SQL script view does not provide this facility. When there are multiple Dimension table that need to be join with fact table, always use calculation view with star join to get the optimize performance. Always try to design information view in which we can push the input parameter at the lower level of the view and apply as a filer on the lower level to reduce the dataset. It will improve the performance. While joining to nodes use join between Integer or BIGINT. Joins on calculated columns/fields with NVARCHAR or DECIMAL as data types, might create performance issues. If the size of the consuming table more than 2 billion we need to partition the table using HASH and RANGE portioning. That partition need to be done before consuming the table in information view.